Thanks to the internet, it’s easy to take your business global. But it’s surprising how many people still rely on an English-only version of their website to reach international audiences. If you want to enter a new market, surely it makes sense to speak their language – whether Spanish, Arabic or Mandarin? Overwhelmingly, the statistics say it does. But to be effective, a multilingual site must be done right. Creating a website in English is natural for a business based in a native speaking country – we know the language and can communicate with it effectively. However, expecting a foreign market to widely accept and understand it, based on the assumption that English is a popular second language in many nationalities, is unrealistic. While it is true that English is the most popular language online, it still only represents 26% of internet users (Statista). This means that international-orientated businesses with an English-only version of their website are missing out on a share of a much wider global market. Even where a foreign consumer understands English, they are still less likely to be convinced by your product or service if they can’t access it in their mother tongue. In fact, according to the Common Sense Advisory study ‘Can’t Read, Won’t Buy’, 85% of consumers won’t make a purchase if information is not readily available in their own language. Why? Because of the very realistic belief that you should be working hard to sell to them, not the other way around. By offering a version of your website in their language, you are showing international customers that they are important and you would like to do business with them. Creating a multilingual website certainly offers many benefits, but ensuring you get it right is essential. A big reason why companies don’t offer other language versions of their website is hesitation over how to effectively implement and manage it. How can I trust content in a language I don’t understand? How will I manage multiple sites? How am I supposed to understand the needs of the target audience? Online translation tools certainly have their place, and can be cost effective. However, they also offer a big drawback. By making a literal translation they can miss out words not directly transferable. Plus they don’t take into account the nuances of a language – the ways of expression that make it culturally meaningful to the reader. It is therefore advisable to hire the services of a professional translator where possible. By establishing a relationship with a translator with sound credentials, you can be more confident the content will be accurate. Whichever way you go, it is important that you translate all the seen and unseen written content on your website. Elements for each page e.g. title, HTML content, alt text images, meta descriptions etc. Blog posts – how far back will you go? If you want to go one step further than translation, you could also localise your site. Consider the format, layout and images – do they match the cultural expectations of that country? Do some research. If they don’t, change them. One of the best ways to manage and display you multilingual website is by adding easy-to-identify links on the homepage of your English site. As you are unlikely to get much organic traffic at first, it’s sensible to use paid ads which can direct people to the correct version as soon as they click. 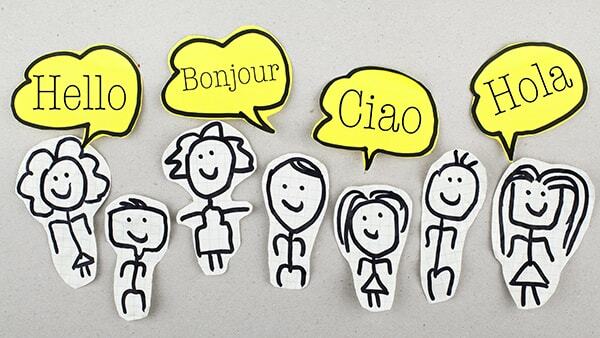 There is little doubt that speaking to your international customers in their own language can help your business grow. But skilful execution is necessary to ensure your multilingual website succeeds.